This was a quick and fun craft project we did one afternoon. We just used Halloween supplies we had on hand. Last year after Halloween I bought a bunch of rings and other Halloween plastic goodies. We discovered this year that the ring part pops off easily and leaves the Halloween shape free to become something else (other than a ring!) So we used them to make a Halloween wreath. The paper plate is the base of the wreath. Cut a circle out of the center of the paper plate. Then trim around the outside of the plate so the wreath is the size you want to accommodate the decorations you have for it. Paint the paper plate. We used orange, yellow, purple and black. We also used the Bingo bottles to paint so that the pain wouldn’t be too thick and would dry faster. Let dry. After the painted plates were dry, we warmed up the glue gun. The girls chose which shapes they wanted on their wreath. We laid them out to see how full the wreath would be and what order they wanted their shapes in. I added glue to the back of the shapes and helped the girls put them where they wanted them. Then they pressed down and counted to five to let the glue dry before we did the next one. After all the decorations were on the front and the glue had cooled, we added the ribbon. I just cut the ribbon pieces all the same length. I doubled the ribbon and glue gunned the ends at the top of the wreath. After a minute to cool, they were ready to hang. Wishing you Happy and Safe Halloween Celebrations this weekend! Looking to update your Halloween music selection for this year? I have just the thing for you! And the best part: 10% of proceeds from sales in October will go to The Children’s Hospital to help children battling cancer. You can purchase Count Crowe’s Halloween Spooktacular on iTunes and Amazon. If you’re looking for ideas for the perfect Halloween party, check out this post on armelle. She’s got everything from party invites to goody bags. She’s also got my creative juices flowing. I’ll be sharing some of our craft projects during the week. Your creative juices are flowing now, too, huh? 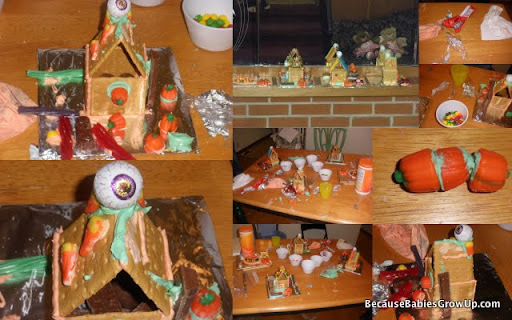 She’s compiled all the links to these great projects and more so check out her ideas for a Halloween party. Here’s one last Halloween craft you can do with all that candy you’ll get Trick-or-Treating! We have enjoyed Make and Takes Monster Mania eBook. It is full of fun ideas that inspire creativity and problem solving skills. I love the projects because most of them use things I have on hand anyway. It makes it easy to pick and project and do it right away. 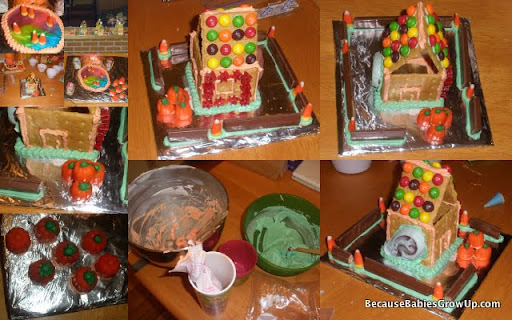 For the Spooky Monster House, though, I spent some time preparing. I thought the prepping was half the fun and definitely worth it. I used the frosting recipe I found here. Looking for more monster ideas? Check out my Monster board on Pinterest! We had fun this week making ghost craft projects. We also worked on a big project inspired by this I saw on a blog I love. But we’ll share that next week, after the Halloween hype is over. Here are our ghosts! How do you color a ghost white? With cotton balls, of course! 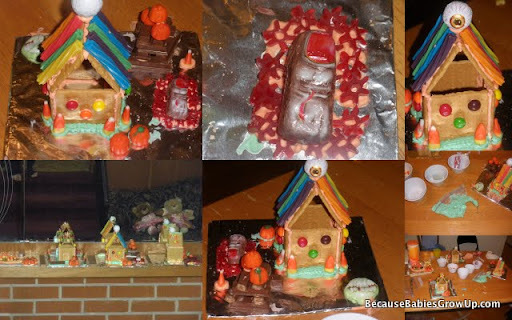 Sammi and Elli both had fun with this project. I downloaded this cute ghost here then printed it in two sizes. For Sammi I gave her the bigger ghost. 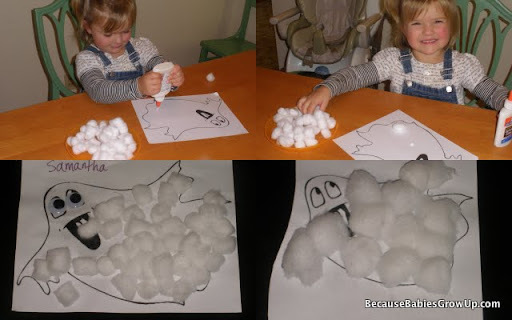 I let her put the glue on her ghost picture and then put the cotton balls on the picture. Sammi finished hers off with googly eyes. She also dumped some glue on Elli’s ghost and then spread it around. For Elli I handed her cotton balls one at a time and told her to put them on the ghost. I tapped my finger on different places on the ghost to help her spread them out. She giggled and smiled the whole time. It was a fun activity. We used thin glue dots to attach the arms and legs to the back side of the ghost. Those glue dots also worked wonderfully to accessorize the legs with shoes, the ghost with eyes and add the word “BOO.” I loved the glue dots so much I ran out and bought some for our projects at home. Happy Halloween tomorrow! What’s your little one going to be?